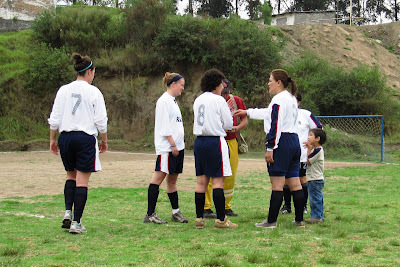 Krysta, Jackie, Haley, Chet, Mike and I were pumped about the idea of joining an Ecuadorian soccer league when Bibi mentioned it about a month ago. The six of us joined the respective men's and women's Ruminahui teams... and have gotten ourselves into quite the adventure. 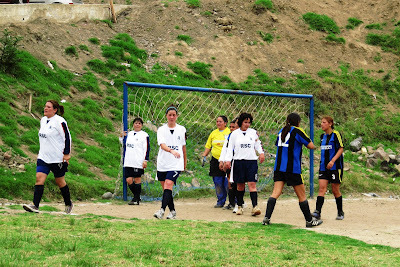 In the last few weeks we've paid our dues, received our uniforms, and participated in our first games. 1. Both teams lost last Sunday. But since we've added hill workouts and soccer drills to our daily routines, I expect big turnarounds. :) Ha. 2. 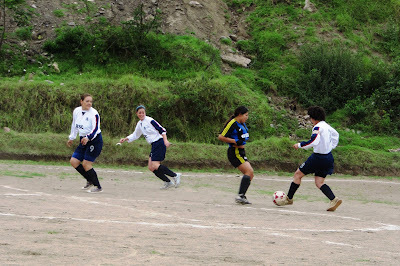 Sprinting up and down a very uneven soccer field is just not the same at 2500m altitude. 3. Soreness. Lots of it. Who knew those muscles existed? Taking a breather... the ball was probably booted into the highway or something similar. Both teams are playing this weekend... we'll keep you posted.